Opps … The Philippines Is Not [Yet] In Recession! During my short stint as Analyst, Business Strategy, one of the economic factors I used to monitor was the Philippines domestic product [GDP and GNP]. Every quarter, I used to make a short summary of the predictions of national economists as well as analysts from international agencies such as the World Bank, International Monetary Fund, etc. and then offered as brief analysis of their arguments. The similar graphic above was included in a quarterly report usually submitted then to the corporate strategists based in India, Dubai or the Isle of Man. GSPIs Business Strategy department was dissolved in December 2005 after the second GSPI president never came back from his annual vacation. With the Analyst-mode still in me, although quarterly reports were no longer required, I continued to monitor this factor through daily reading of national economic news. New York-based think tank GlobalSource and investment research firm UBS Securities scaled down their full-year growth forecast for the Philippines to 1.0% and 0.5%, respectively, following the report of anemic performance in the first quarter … GlobalSource and UBS initially expected the countrys GDP to grow this year by 2.5% and 1.8% … The Philippine economy grew by just 0.4% in the first quarter … despite governments hype about a fiscal stimulus, virtually no trace of it could be found in the numbers, said GlobalSource in a report dated June 9. 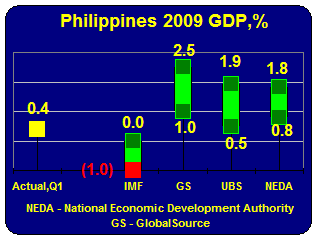 Most economies in Asia have already implemented expansionary fiscal policies. . . . Room to maneuver is more limited in economies such as India and the Philippines, which already have high levels of public debt. In its Statistical Appendix, IMF forecasts a zero-growth GDP scenario for 2009 and 1.0% growth in 2010 for the Philippines. Only three countries are forecasted with 0.0% GDP for 2009, the other two are Columbia and El Salvador. The IMF scaled back yet again its forecast growth for the Philippines this year to negative 1.0% in terms of the GDP. … At the conclusion of the IMFs staff visit, mission leader Il Houng Lee told reporters there was no way Manila would escape a contraction this year. … But, according to Lee, the negative-growth scenario was their best growth prospect for the Philippines this year. . . I think it will be difficult to avoid negative growth this year, he reiterated. The revised [IMF] forecast came as new figures showed exports falling 35.2% in April from a year earlier, with shipments of electronic goods and garments still plummeting amid the global economic downturn … On the basis of the first quarter data, it seems that the impact of the global slowdown on the Philippines is stronger than what we have anticipated, and therefore we are revising the numbers downwards, IMF head of mission Il Houng Lee told a briefing yesterday. The economic managers agreed on Wednesday to scale back the countrys growth path this year, resetting local output or the GDP to a range of 0.8% up to 1.8%, Socioeconomic Planning Secretary Ralph Recto said. … The reductions in growth were in recognition of forecast slowdown in consumption and investments, which are key growth drivers. Buoyed with consistent performance of overseas remittance, various Philippine economic officials, however, allayed fears that the country will be in for a recession. In a live radio interview, Presidential Spokesperson for Economic Affairs Gary Olivar said that for the government to declare a full blown economic crisis, there must be negative growth for two consecutive quarters. We havent experienced that so far and it looks like its not going to happen, said Olivar in the dialect. Deputy Presidential Spokesman for Economic Affairs Rolando Tungpalan stated that the Philippines will not go into recession following warnings from the National Statistics Coordination Board (NSCB) the country was on the verge of recession with the 0.4% GDP growth from January to March this year … Tungpalan, who is also deputy director general of the National Economic Development Authority (NEDA), however, refused to openly dispute the National Statistical Coordinating Board [NSCB] statement. At the joint celebration of the 111th Philippine Independence Day and 8th Filipino-Chinese Friendship Day at Hotel Sofitel, President Arroyo said the centuries-old relationship of China and the Philippines have now taken greater significance, as Chinas breathtaking economic success earns the admiration and respect of the world community, especially in the midst of the global slowdown. … And as China leads everybody out of the global economic crisis, the Philippines is one of those that benefits the most, she said. [I]ssues arising from the apparent disconnectbetween the low first-quarter growth and the robust lending levels and government disbursements puzzled monetary officials and put those in the Executive on the defensive. … Liquidity-enhancing measures adopted by the Bangko Sentral ng Pilipinas on one hand and accelerated spending by the government on the other are policy responses normally translating into greater economic activities. … Socioeconomic Planning Secretary Ralph Recto asked monetary officials like Diwa Guinigundo about the folly of throwing money at problems. … Did disbursements translate to spending? In short, we need to ensure at this point that the additional budgetary allocation was actually spent, Guinigundo said. … According to Finance Undersecretary Gil Beltran, consumption activities during the quarter grew by only 8.9%, the lowest in 25 years. … Meanwhile, Malacañang said on Tuesday [02 June] that it does not need a miracle, alluding to the assessment of Moodys Investors Service, to save the country from recession, as it is counting on the full implementation of programs under the Economic Resiliency Plan implementation (ERP) to improve economic growth in the second quarter. Based on the above projections, nobody could accurately predict the Philippine GDP by year-end, or even for the second quarter, which would be available maybe by the middle of the third quarter. Yet, I would dare predict that by year-end, the Philippines GDP would have grown at least somewhere above zero or just below 1.0%. That is, if the nations economic managers make the right decisions; and the President, an economist, pursues the right directions. The Philippines made it through the two-year Asian Financial Crises, by Gods grace it could venture this one. Incidentally, various news reports have been filed that despite the global economic crises, Filipinos are still upbeat on the economy! Or maybe, most of them are just laughing through the pain? Typical Filipinos!